Complete the following steps to connect the NI ELVIS III to your host computer via a wireless network. 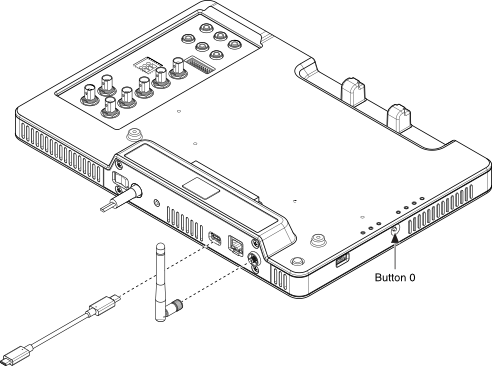 The USB cable is also required for the initial configuration of the wireless network. Configure a wireless network on the NI ELVIS III. The following steps are required for initial configuration only. The NI ELVIS III automatically connects to the wireless network that it has connected to before. Use a USB cable to connect the NI ELVIS III to your computer, as explained in Connecting to the Device via USB. In Internet Explorer, enter http://<USB IP address>/WIF.html in the address bar to launch the System Configuration page. To view the IP address of the USB connection, press and hold the user programmable button (Button 0) on the left-hand side of the NI ELVIS III workstation until the OLED display on the workstation is lit. The IP address of the USB connection appears after the icon. You must use Internet Explorer to complete this step. The IP address of the USB connection appears only after you install the Measurements Live Support Files. Click the Network Configuration button on the left of the web page to display the Network Configuration page. 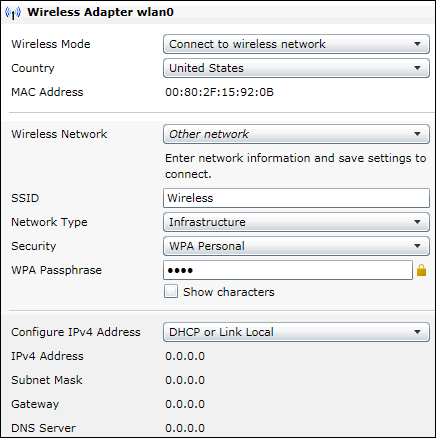 In the Wireless Adapter wlan0 section, select Connect to wireless network from the Wireless Mode pull-down menu. Select the country in which you are located from the Country pull-down menu. You must specify a country before you can select an available channel for the wireless network. Select the wireless network you want to join or select Other network if you cannot find the wireless network from the Wireless Network pull-down menu. Enter security settings for the wireless network that you select. You must select Infrastructure from the Network Type pull-down menu because the NI ELVIS III does not support Ad Hoc networks. Select DHCP or Link Local from the Configure IPv4 Address pull-down menu. This option specifies that the NI ELVIS III automatically acquires an IP address. If the connection is successful, you can see the IP address of the wireless network connection on the OLED display of the NI ELVIS III. Press and hold the user programmable button on the left-hand side of the NI ELVIS III workstation until you turn on the display. The IP address of the wireless network connection appears after the icon. Go to Setting Up the Host Computer to set up the software environment. Go to Configuring the Device if you need to upgrade the software on the device or set up an administrator password.